The combination of two great sports, football and golf to create the best game you will ever play. Play over 18 holes with a size 5 football. All you have to do is complete each hole, kicking the football into the oversized golf cup using your feet, take as few shots as possible. 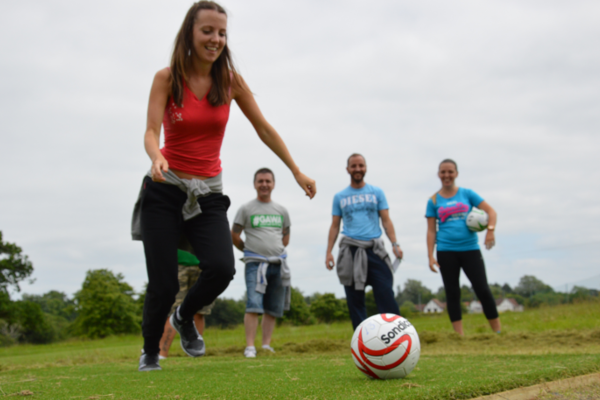 The great thing about Footgolf it requires a low skill level and its suitable for all ages. The average round takes approximately one hour but if the opportunity arose you can go around again. Footgolf is played in teams of no more than 4 people. FootGolf is just what is says on the tin, two great sports combined, football and golf, to create the best game you will ever play. Play over 12 holes with a size 5 football. All you have to do is complete each hole, kicking the football into the oversized golf cup using your feet in as fewer shots as possible. The player with the best score will kick off first on the next hole followed by the second, etc. Pick your four best foot ballers, choose your team name, book your tee off time and enjoy a round of Footgolf. Each team will be split into two, then join two members of another team. The new team of 4 will play while keep an eye on each other’s scores. At the end of the day the team with the lowers scores will win the cup. To keep you on the ball and to bring out the competitive streak in you there will be spot prizes throughout the day. Finish off your round with a burger or hotdog and drink which is included in the price. Pick your four best foot ballers, choose your team name and book your tee off time. The game will last 45 minutes to an hour after which you will get a burger or hotdog and a drink. There is a prize for the team with the lowest score and some spot prizes throughout the day. Cost: £24 per team of 4 people includes burger or hotdog & drink. Only teams with four eligible players will qualify for prizes. Your four-person team will be split into two. Your first two players will play alongside two players from an opposing team and then the other two players in your team will play against the other two opposing players. The winners will be the team which has the lowest four person combined team score. All tee shots must be played from tee boxes. The person furthest away from the hole after all tee shots have been played goes first. When two balls are on the green and a ball is in the other player’s line it can be marked then lifted to allow the player to take their shot then replaced to the same spot. If a ball strikes another ball only on the green, the ball that was at rest should be put back to its original position. If a ball is deemed unplayable for any reason there is a two shot penalty. So if you were on your second shot it now becomes your fourth shot and only to the nearest point of relief no closer to the hole. Where is the Footgolf Competition? What time does the Junior Competition start? 10.30 am start with tee off times every 10 minutes until 12.00pm. What time does the Senior Competition start? 1.00pm start with tee times every 10 minutes until 3.30pm. How many holes is the course? The event will be held on an 18 hole Par 3 Footgolf course. Will there be any prizes? To keep you on the ball and to bring out your competitive streak, there will be a prize for the overall winning team and spot prizes throughout the day. Team entry into the competition of your choice. Burger or hotdog and a drink when finished. You can book on the day if there are slots free. In the event of a cancellation, a minimum of 7 days’ notice must be given in order to receive a refund. Can I change my tee off time? Yes providing there is availability to do so. Who do I contact to change my tee off time? 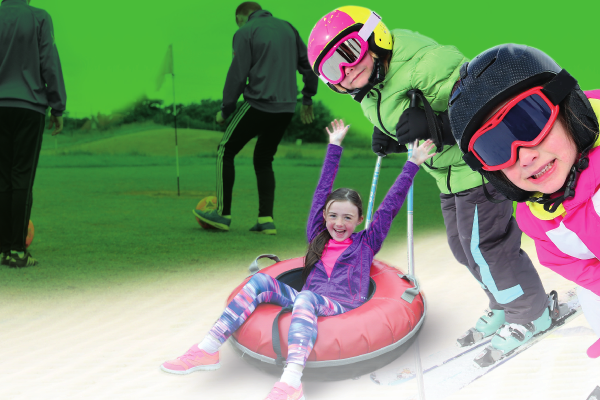 Craigavon Golf Ski Centre staff will be able to change your booking time. To check availability call the Centre on 02838346606. You will need quote the original booking number and team name to make any changes to the time. Must I sign in on the day? All teams will be required to sign in on the day. Please arrive 15 minutes before your tee off time to ensure you have enough time. We will provide all the footballs for the event. If you prefer to use your own, you can. All participants are asked to dress for the weather and advised to wear old trainers. No football boots or tops allowed. Yes, there will be changing facilities onsite. Activities start at 10.00am and finish at 4.00pm, but best to arrive at 9.30am. Price of £20 per person includes the range of activities and lunch at the onsite Alpine Lodge. All essential activity equipment and safety equipment is provided, but you will need to bring a coat, gloves, old footwear and a change of clothes. Three action-packed activities days that will give your adventurous kids the opportunity to experience a range of fun and proactive activities.